Let it snow, let it snow, let it snow! 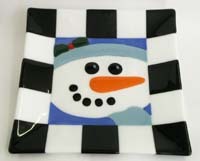 We're firing up the kiln and making a heartwarming snowman plate this month. This cuddly little fellow can be used for any number of things from serving tray to seasonal wall decoration. When choosing your glass colors let your imagination fly. We have built several of these bundled-up buddies this season and he looks fabulous in any combination of colors. Best of all, this project is so fast, easy and fun to make, you'll find yourself wanting to make a bunch! The design pictured is a 10-inch square. Using Glass Eye 2000 the pattern can easily be resized to fit any size square slumping form you have available. I have constructed this pattern with ease, as small as a 7-inch square and as large as a 12-inch square. Resize the pattern. Resize it to fit your slumping form. Cut the base layer. Cut a piece of white opal fusible glass the same size and shape as the perimeter of your pattern. The one pictured is cut to 10 inches by 10 inches. Cut the design layer. Using your pattern as a guide, cut fusible glass to make the border, the snowman's hat, holly leaves, holly berry, face and scarf shapes. Stack the cut pieces on the base glass to form the design. Cut the accent layer. Using the pattern as a guide cut glass for the snowman's eyes, nose and mouth pieces. Stack the cut pieces on the design layer to form the snowman's face. Fuse the assembled project according the manufacturer's published firing guide. Slump the fused project according to manufacturer's published firing guide. Lisa is an award-winning artist who has been working with glass since 1988. She has published several pattern books, including Get Fired Up!, and has written numerous articles for industry publications like Stained Glass News, Glass Craftsman, Glass Patterns Quarterly, Glass Art, and Glass Breaking News. She has websites at www.originalsinglass.com and www.lisavogt.net. You can reach her by email at lisa@lisavogt.net. Lisa resides in Tampa, Florida with her husband and two girls.